The following presentation was given in the form of a speech by Zero Waste Europe Director, Joan Marc Simon at the ‘Resourcing the Future 2016’ conference organised by CIWM in London. Is the Circular Economy strategy on the right track? Yes but it is still too slow, in need of some fine-tuning and to escape bad habits from the past. The exercise we are undertaking is an ambitious one, close the material loop and turn waste into resources; creating a zero waste society from which the EU’s economy and environment should benefit. How do we know if the Circular Economy strategy is on the right track? In my opinion there are three guiding principles to follow which shed light on the path to follow. Is doing the right thing easier and cheaper than doing the wrong thing? Today in many places in the EU mixing all the garbage together and have it processed in expensive ineffective facilities before burning it or dumping it in landfills is still the easiest and cheapest thing to do. Unless you plan to turn 500 million Europeans into environmentalists we need to change the way we do things and make it easier for the citizens to do the right thing whilst making visible the reward for this effort. In this sense the proposals from the text of the European Commission and the European Parliament to make separate collection compulsory for most waste fractions, especially of biowaste, is a good one, as it will set high targets for recycling because it provides legal certainty for investment. It is also good to make recovery and disposal activities more and more expensive so that recycling and composting become comparatively cheaper. For this purpose fiscal incentives are very important; from landfill and incineration taxes to widespread use of pay as you throw systems. The examples from the ZWE case studies from the network of Zero Waste municipalities illustrate very clearly how it is possible to implement aggressive source separation schemes in less than 10 years (in the case of Parma less than 5 years) doubling recycling rates and radically reducing the waste that is to be sent to landfills and incinerators; what is known as residual waste. These examples prove that working on the upper levels of the waste hierarchy are more effective and cheaper than any other option and hence that the recycling targets set by the European Commission and increased by Bonafè’s report are perfectly realistic. However we warn about the danger of lock-in situations which can jeopardise the implementation of a zero waste strategy and also substantially delay the achievement of the EU waste recycling targets. This applies notably to the cap on waste sent to landfilling which the EC wants to set at 10% of all MSW generated and the Bonafè’s report proposes to reduce to 5%. Whilst it is important to progressively reduce the amount of waste sent to landfill, if we are serious about moving towards a Circular Economy we need to focus on reducing “leakage” from the system and that means landfill and incineration. Failing to do so will mean repeating the same mistake that some countries committed when implementing landfill bans and which caused that the waste diverted from landfills to end up in incinerators proportionally more than to recycling. 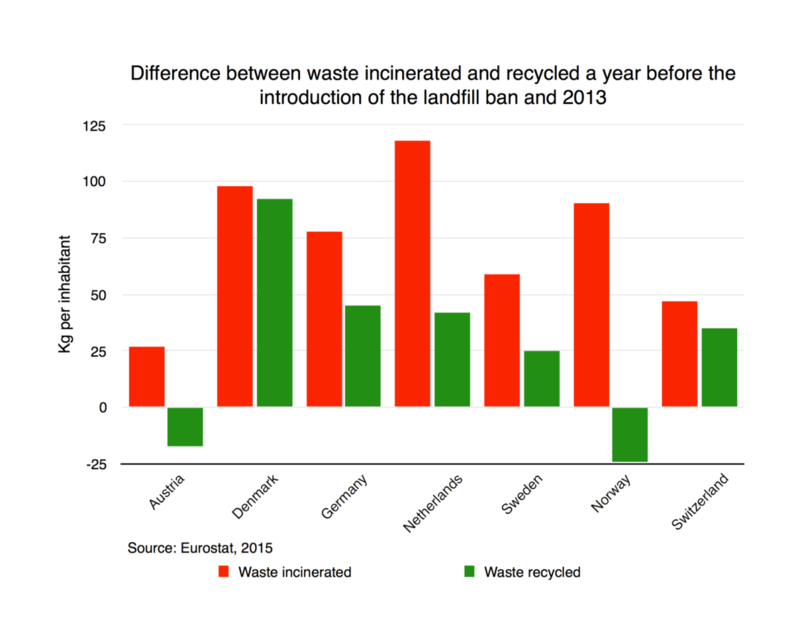 In the cases of Austria and Norway they saw waste sent for recycling decrease in favour of incineration. The graph below shows how landfill bans tend to drive more incineration than recycling or waste reduction. We need to gradually phase out incineration and landfilling and the most effective way to do that is by using a residual waste reduction target. We advocate for the inclusion of a residual waste target of 100kg per person per year for 2030. Slovenia is very close to achieving this and Holland has set it as a target. Why not having it at the EU level to complement the recycling targets? The EU needs to change the lenses with which it looks at waste management and complement the recycling targets with residual waste target to tackle the amount of waste leaking the system. When I rent a car my interests and those of the rental company regarding the car are the same, we all want a car that works well, that lasts and which is easily and quickly repairable when I buy a phone they are not. I want a phone that works and lasts and the company wants to my phone to break soon so that I get a new one. It will be impossible to have a circular economy for as long as the business model of producers is based on selling as much stuff as possible in as little time as possible. This results in wasteful products, designed for the dump, which break to soon and are neither repairable nor recyclable. In a CE both producers and consumers should benefit from products that are toxic-free and designed to preserve the energy and the value of its components. If these interests are aligned we will see the amounts of waste decrease sharply. For this to happen we need to design the right incentives for providers and cosumers. This goes beyond waste legislation and entails working on extended warranties, products passports, facilitating information about life-expectancy of the product, reduced VAT for second hand and repaired products, changing depreciation rules to adapt them to the new extended lifes of products and progressive green procurement rules. A basic point that is relevant for the discussion on waste is the creation of a feed-back mechanism between waste and design in order to avoid the product becoming waste in the future. In the following graph about EPR we can see how in Europe the implementation of EPR is still not covering most of the products – 55% not covered and is performing poorly for those that are covered by EPR with only 18% of a product’s waste is collected through EPR. With these results it is clear that the EPR schemes should improve their performance but we should also consider expanding the scope of EPR to cover more product categories than the current ones packaging, ELV, batteries, tyres, WEEE-. Expired medication, phytopharmaceutical products, textiles, domestic linen and shoes, domestic chemical products, graphic paper, lubricants, frying oils, construction & demolition materials (C&D), printer cartridges, fluorinated refrigerants or nappies are all potential targets. In fact we should reverse the question and ask, of the 70% of the waste products, which product categories should be exempted from producer responsibility? In France they have alreadymodulated producer responsibility fees according to the circularity of the product, we should explore a similar approach for Europe. Finally, there are some items that should have no place in a Circular Economy and would need to be banned outright, microplastics in cosmetic products are just one example. The prospects for the Circular Economy package look bright and after a soft start from the side of the European Commission it looks like the European Parliament with the Bonafè report is committed to raising the stakes. A fantastic opportunity to create jobs and economic activity in Europe whilst reducing the burden on environment and moving towards Zero Waste Europe.